This could be taking self-service to the extreme. Getting a drink has never before been such a game of skill. In a cold room with a wet moppable floor are almost a dozen large metal vats. Each is filled with cider and they are the reason the floor can be easily cleaned, as is about to become obvious to me. You see, the only way to get the cider out of the vat is from a tiny tap that shoots out a jet of liquid several metres long. It comes out with such a speed that it splashes to the ground in the middle of the room. If you don’t jump in with a glass first, that is. Holding my glass, I approach the vat. Someone turns on the tap for me and the cider rushes out. I try to gauge the position of the jet and lunge in, catching the apple goodness. It gushes around in the glass, quickly filling up. When I think I’ve got enough, I break out of the stream and some more hits the floor before the tap is turned off. This may all sound like a bit of fun – and it is. But, more importantly, it’s also tradition. I’m in the Basque region of Spain and cider has been a local product here for centuries. At this particular cider house – called Petritegi – it was first produced about 500 years ago at the beginning of the 16th century. Back then, the owners used a traditional wooden press to make cider from apples they grew on their property. The current owners use more modern techniques and a lot of the production is automated. But there are still plenty of homages to tradition. It’s appropriate, considering that Petritegi is currently being run by the fifth generation of the family who took over the business in the early part of the 20th century. Obviously the way you get the cider is part of the tradition here. You’re not supposed to fill your glass the whole way up (I get told off for taking too much the first time) because this custom comes from a time when buyers would taste the different ciders before choosing the one they wanted. It means that you generally hang around in the cellar here while you have a few (small) glasses of cider from different barrels. Then you head out to the restaurant area and grab a table. This is where the next part of the tradition comes in. We all know what happens if you drink a bit too much alcohol on an empty stomach. The people here around San Sebastian knew that centuries ago as well and so they used to bring along their own food to barbecue while they drank. 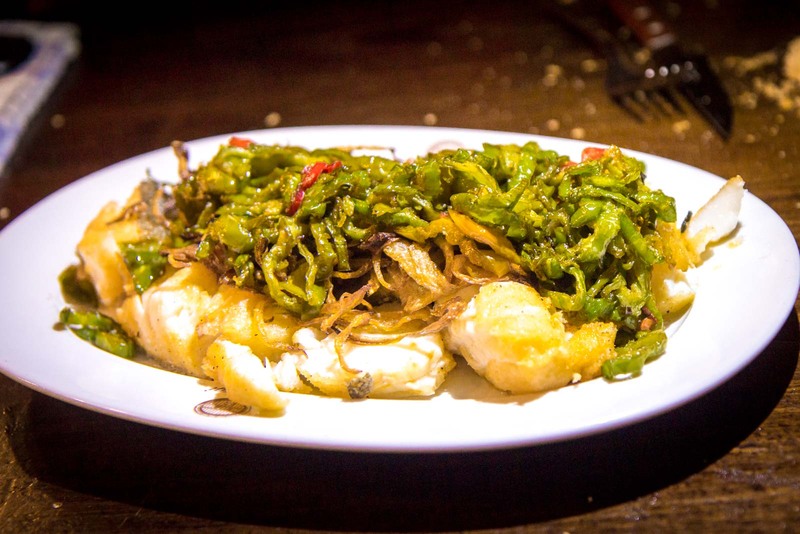 These days, you don’t need to do the cooking yourself but you will be served the same kind of food – salt cod omelette, fresh cod with green peppers and char-grilled steaks. Just as they have always done at the Petritegi Cider House, you still sit on long wooden tables to eat the food. If it’s a busy night, you may need to share a table with other people. That’s all part of the fun – it’s a social atmosphere as everyone sits around together and feasts and drinks. Speaking of drinks, I make a few trips back to the cellar area to try more cider and fill up my glass during the meal. The cider here in the Basque region tastes different to the type I’m used to. It’s certainly not as sweet as some of the big brand ones that come in bottles. But it also tastes even earthier and natural than brands I’ve tried around the world that claim to be organic. It’s because of the way the cider is made here – and has always been made. The final product has no sugar or carbonation added to it. The apples are turned into a paste and are then put in barrels to ferment – but they’re left there for just 3 months. It means the final alcohol content is only about 4 or 5 per cent and the flavour is completely natural (and, not surprisingly, tastes a lot like apple!). Petritegi is just a few kilometres away from San Sebastian. It’s one of a number of cider houses in the region but a lot of them aren’t open all year round because the official cider season is only from January until the end of April, when fresh apples can be used. But Petritegi is open throughout the year because of the large volume of cider that it is able to hold in the barrels. Alternatively, you could take a tour which includes a meal at the cider house as part of the day. I think this is an interesting one. The people of San Sebastian and the Basque region are proud of their traditions and it’s nice to be able to share them with the locals. It’s even nicer when those traditions involve such delicious cider! For accommodation in San Sebastian, I suggest the cool and modern Zenit Hotel. Time Travel Turtle was supported by San Sebastian Tourism in partnership with iambassador but the opinions, over-written descriptions and bad jokes are his own. Seems like a great thing to do in San Sebastian! I like the way it sprays from the barrel; I’ve never seen that before with any other drink. No, I hadn’t seen it before either. It actually took a little bit to get used to and I was worried I would splash it all over myself. But once you get the technique right, it’s pretty easy.